Religious Diplomacy-based Advocacy Framework for facilitating summits and conferences, capacity building, and research education. The IIPC advocacy framework is designed to support FBOs and CSOs working with community faith leaders, who have access to, influence over, and trust of their people, to effect behavior change. IIPC’s advocacy approach is based on Maqasid Al-Shari’ah and Fiqh-ul-Ihya using Religious Diplomacy to improve the interpretation and understanding of the religious texts within contexts. It ties religion to the Sanctity and Dignity of Life issues in areas related to education, governance, health and socio-economic development. Religious Model: The Islamic Jurisprudence of Life model highlights 4 principles of the preservation, promotion and development of Property, Intellect, Religion and Progeny, which provide support to a 5th and central principle, of the preservation, promotion and development of the Sanctity and Dignity of Life. Development Model: IIPC advocates a holistic, comprehensive and balanced development scorecard with four perspectives of Material, Intellectual, Spiritual, and Socio-political development, which together contribute to a Quality of Life development index. 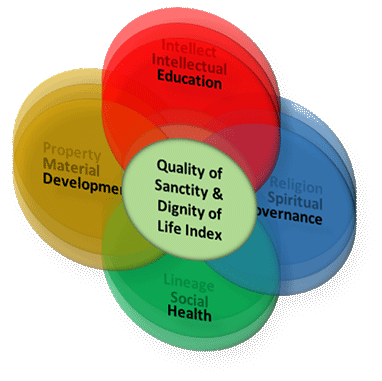 Intervention Domains: IIPC has four service domains of Development, Education, Governance and Health, which again support the Quality of Life index. The SDGs are mapped on to the framework. The natural and legal right, freedom, and security to preserve, protect, and develop one’s God-given intellect – the mind, senses, thoughts, opinions – and the capacity to reason and choose between alternatives without any undue hindrances from any individual, group, or authority. The natural and legal right, freedom, and security to preserve, protect, and develop one’s property and wealth, by acquiring, owning, controlling and passing it on to progeny, any individual or group of choice without any undue hindrances from any individual, group, or authority. The natural and legal right, freedom, and security to preserve, protect, and develop one’s religion, faith and beliefs – willfully choosing the object, form, place, and time of worship without any undue hindrances from any individual, group, or authority. Islam identifies and emphasizes the natural and legal right, freedom, and security to preserve, protect, and develop one’s lineage by procreating, raising a family and providing it with identity, integrity, legitimacy, continuity and well-being without any undue hindrances from any individual, group, or authority. Through progeny emerges the individual, family, society and a socio-pollical system.